When speaking of Atlanta suburbs, the city of Alpharetta is sure to steal the conversation. 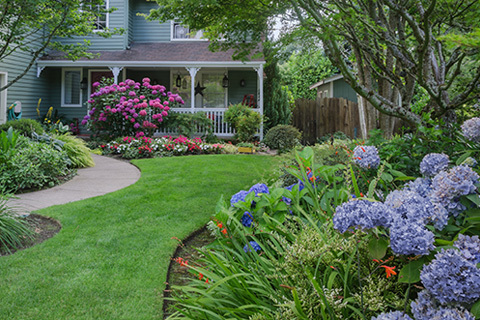 One striking trait in this suburb is the abundance of trees, shrubs and well-manicured yards. While there are dozens of attractive plants we could share, our arborist explains characteristics of 5 shrubs that are sure to impress and perfect for your Alpharetta Ga yard. Plants, trees and shrubs require certain conditions to thrive and grow into healthy specimens. Knowing the watering, sunlight and soil requirements of a shrub will help ensure it develops properly. Our Alpharetta tree removal and planting experts are available to help you choose the ideal shrubs and trees for your yard. However, these 5 shrub species develop nicely and are commonly planted by residents of Alpharetta. Rhododendron – With the ability to reach a height of 15 feet or more, your hedge solution is at hand. Rhododendron is the national flower of Nepal – Ask your friends where that is! The conversation alone makes this stunning species worth it! Planting on the North side of a building – protecting it from morning sunlight is optimal for this species. Overwatering will cause a waterlogged root system that may lead to plant failure, while under watering can also damage these shrubs. Fertilize annually in the fall or early spring for best results. Blooming from the end of winter through early summer, there is an added bonus to having this shrub. Hummingbirds will be racing through your landscaping attracted to the blooms. Thus, adding one more element of desirability to choosing a Rhododendron. Florida Anise – With fruit shaped like a star, Florida Anise has been popularly dubbed as Star Anise. This evergreen shrub grows to a whopping 10 to 12 feet in height and 5 to 8 feet wide. It thrives in rich and moist soil being best suited for shade with morning sun. However, this beauty – once established – possesses a high tolerance to drought conditions. A fun snippet about the Florida Anise is that it protects itself with poisonous aromatics in the foliage deterring animals and insects from making it a meal. Camellia Japonica – Commonly known as ‘Rose of Winter’ – its Alabama’s state flower. With thousands of cultivars having varied colors and forms of flowers, creating diversity in the landscape will be a cinch. This stunner blooms in winter and early spring and thrives in a semi-shade environment with moderate to regular watering. Given the ideal conditions, just sit back and be amazed at just how beautiful this shrub can be. Hydrangea – If strength combined with beauty is your aim, the Hydrangea is certainly the right pick for your yard. Well known for its large, circular blooms, it steals the show by staying in bloom from the beginning of spring to late fall. That’s right, while the others are full of nakedness, the Hydrangea keeps putting on a show. Location is key. You will want to protect your Hydrangeas from strong winds and hot afternoon sun – planting them on the East side of a building will help create a shaded afternoon. Overwatering will cause the roots to rot, killing the shrub. In the beginning, an all purpose slow-release fertilizer are helpful in ensuring a strong start to an incredible shrub! Those beautiful blooms come in an array of colors including; white, blue, pink lavender and rose – at times with multiple colors on the same shrub. This color variety occurs with the pH level of the soil, however, the white bloom is unaffected by this factor. Fatsia Japonica – If you are looking to fill a spacious area with an explosion of green, look no further! This evergreen shrub – native to Southern Japan and South Korea – reaches an astounding 10 to 20 feet tall with its leaves spiraling up its branches creating beautiful symmetry. Medium to full shade with compost rich and moist soil is a winning ticket for the Fatsia Japonica. A semi-protected location is important, as strong winds and excessive sunlight tend to damage the foliage. 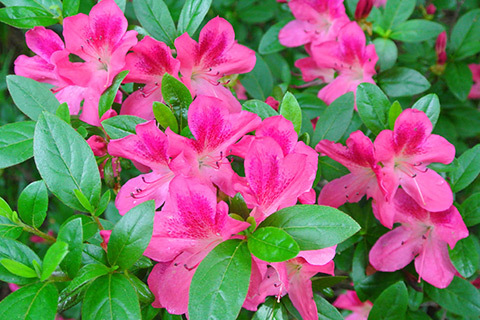 Fertilize annually with a tree and shrub fertilizer in the spring. Sometimes referred to as the ‘Paper Plant’, its small white flowers make an appearance in late fall and early winter. Those same flowers give way to a small black fruit. This shrub makes for an excellent conversation piece in a well-structured garden. In addition to the striking colors, the addition of healthy shrubbery to a landscape cannot be overstated. Properly planted and arranged shrubs will help prevent soil erosion and in many cases, raise the property’s curb appeal! Whether it’s filling in the gaps or structuring a hedgerow, the aforementioned shrub species are sure to create an impressive and practical landscape. Familiarize yourself with the conditions of your yard, then choose the best suited shrub for a beautiful addition to your landscape.